Here is a link to the Hopper Custscene. In this mission, the player will have to pilot the Hopper to the Cruzer and destroy it before it can leave the orbit of the moon. Later, when we open up the MMO version of the game, the Cruzer will be required to transport troops / assets to other planets throughout the solar system. This is the UI test for the Factory interior. We are integrating the Vehicle Fabrication System and custom weapon loadouts into the game for the Steam release. In order to build a vehicle, the player will have to exit the vehicle (I key for eject) and run over to the Factory Console. Once inside the Factory, players can customize vehicles (eg larger or smaller engines, different shield types, etc) and weapons. Fabrication assemblies and loadouts can be saved for quick access later. Wingmen can use up to four assembly configurations per vehicle. 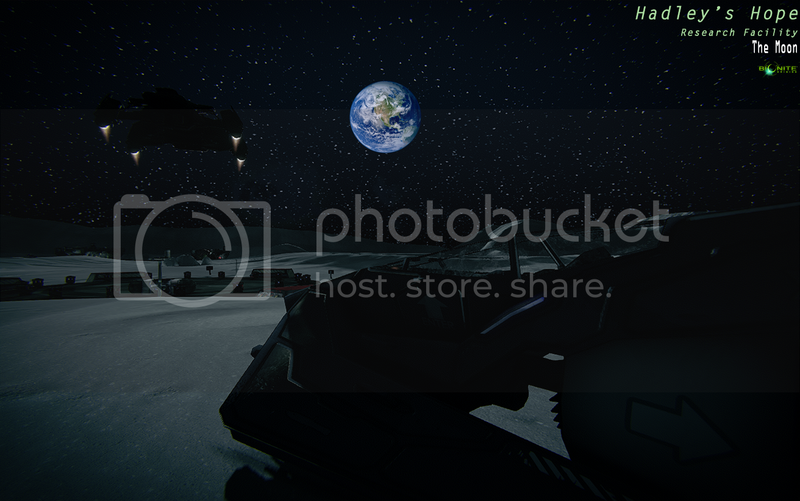 The Earth's lighting in that photoshopped picture doesn't look very realistic, too bright around all edges. LtFEED wrote: It might be easier to make the earth a mesh, rather than putting it into the skydome material. If you do that you run the risk of it being subject to parallax. Much as I appreciate the reference, isn't "Hadley's Hope" stepping on the toes of the Aliens IP a little? good point AH, were going to run some tests and see what happens. the trick is to keep it within the world. I was always a Goon fan over the Pythons, personally. That said Eddie Izzard, who was inspired by both, is right up my street. And not the factual corrections recommended by me, apparently. Also, it might be worth remembering that they're is now a precedentfor legal action for failing to deliver on kickstarter rewards and stretch goals. I wouldnt want to be the guy signing the checks for Star Citizen, those guys are in a world of hurt. I hope they change the laws so it cant happen again, that is just downright fraud. LtFEED wrote: I wouldnt want to be the guy signing the checks for Star Citizen, those guys are in a world of hurt. I hope they change the laws so it cant happen again, that is just downright fraud. Except every indication is that Star Citizen is on track to honour those promises. I raised the point because I'm not entirely certain Bionite will be able to. Derek Smart, the main proponent of the "Star Citizen is a scam" narrative, needs to be looked at closely - he's a developer of similar 3DoF space games himself with titles stretching back to the 90s, and every single one of them has been consistently beaten by those Chris Roberts worked on. He shut up pretty quickly after the recent convention - after the massive cast that's been announced, either Star Citizen is not a scam or Gary Oldman, John Rhys-Davis and Gillian Anderson are all bloody idiots. There's a bit of discussion on that in Episode 4 of the SIMICast, for those interested. well at least those actors got paid. At the rate of development going of for SC, there is no way it will ever get done. And when it does get done, the engine will be horribly outdated. Derek Smart is doing everyone a favor by requesting documentation about where the kick money went. As soon as he did that, then all of sudden, his credibility was in question. This inst just him saying this but other publications have printed articles about this also. Look at the SC kick page, only the white knights are standing by that project now. its dead and all the people that got tricked by SC and Kickstarter will never see a finished game, of if they do, it will be a shadow of what they promised. Instead of spend millions of dollars on actor VO's, SC should have just finished the game. Are those VO actors really that important to the game? The version of CryEngine used by SC is CryEngine in name only - an awful lot of staff working on SC came from Crytek in the first place and have helped to modify the engine beyond recognition. Derek Smart's credibility has always been in question. That's not to say that Chris Roberts' hasn't, but he's standing on much more stable ground given that there's no evidence of anything shady and no conflict of interest involved. Some of your comments regarding StarCitizen really do betray that you've not been paying fantastically close attention. CitizenCon sold out *incredibly* quickly, I remind you. Still, if requesting documentation about the money is doing everybody a favour, then can we request the same from you? As a sound engineer, yes; VOs are that important. That trailer for Bionite that got put out last summer was killed by a combination of two things; the script - which was briefed, written and tested for a two-minute action trailer - was turned into a bland one-minute exposition screen with an action scene tacked on the end, the voice acting in which was both ad-libbed and completely flat. AHadley wrote: then can we request the same from you? You can if your a Backer. Although i never promised any transparency in my books, if one of our backers requests that info (which no one has) I can send them a spending report. All of my backers (including Ken Levine) got their rewards already, so i get to sleep at night, unlike the people that own SC.